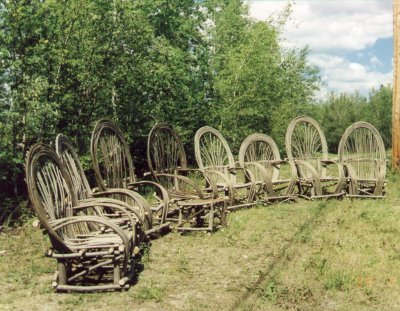 Saskatchewan maker also taught rustic willow furniture workshops as well as online photography classes. For groups of two to three these were done right at his Saskatoon residence. For larger groups, these were generally done on site. Most of the workshops were generally planned by someone in the community where the workshops are to be held. If you have a local hotel or similar community building that can be used, this is a great way to go. This becomes important if it happens to rain that day, or it is too hot to work outside. If you have sturdy work tables in this building these also come in handy. Please note--do not build this type of chair on a good community hall table used for eating. The surfaces will be marred. A minimum of eight students to a maximum of 12 students, paid in advance to the local community chair person is required. Student fees are $200.00 per person. This includes a copy of our electronic book. At the end of day two, student will have completed their chairs and can take these home. Students will also have learned enough technique to build chairs on their own. For a community to be able to put on a workshop you should allow yourself a lead time of between one to three months--this will of course depend how fast you can sign up students. A fixed date has to be established.